"The balance of risks remains skewed to the downside," the IMF says. "Failure to resolve differences ... would lead to higher costs of imported intermediate and capital goods and higher final goods prices for consumers." The fund said it expects the world economy to grow by 3.3% this year. That's down from its previous outlook of 3.5%, which was also a downgrade. The IMF added that it expects the economy to expand by 3.6% in 2020, however. The IMF's report comes as Congress struggles to pass the United States-Mexico-Canada Agreement (USMCA), a trade deal signed by President Donald Trump and his Mexican and Canadian counterparts at the time, which would replace the existing North Atlantic Free Trade Agreement (NAFTA). Meanwhile, the Trump administration is trying to hammer out another trade deal with China. "The balance of risks remains skewed to the downside," the IMF said. "Failure to resolve differences and a resulting increase in tariff barriers above and beyond what is incorporated into the forecast would lead to higher costs of imported intermediate and capital goods and higher final goods prices for consumers." "Higher trade policy uncertainty and concerns of escalation and retaliation would reduce business investment, disrupt supply chains, and slow productivity growth," according to the IMF. "The resulting depressed outlook for corporate profitability could dent financial market sentiment and further dampen growth." On March 27, Reuters reported China had made unprecedented progress on issues like forced technology transfers, which have been sticking points during its negotiations with the U.S. Trump also said on Thursday "we'll know over the next four weeks" whether a deal between the world largest economies can be struck. But failure to strike a deal would hurt the U.S. economically and would also derail China's efforts to reinvigorate its economy, the IMF warns. China's economy expanded by 6.6% in 2018, which was its slowest pace in nearly 30 years. The Fed reversed its stance on policy earlier this year, eliminating all expectations for even a single rate hike for 2019. This follows four rate increases by the U.S. central bank in 2018. 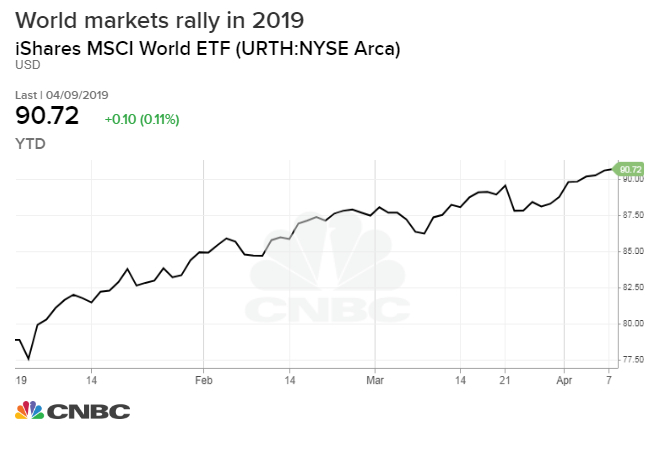 The Fed's reversal contributed to the market's hot start to 2019, with the S&P 500 notching its biggest first-quarter gain since 1998. However, the IMF said: "The market-implied path of expected policy rates remains below the Federal Open Market Committee's projections, raising the possibility of a market reassessment of the expected policy path if US economic data remain strong. This could result in higher US interest rates, renewed dollar appreciation, and tighter financial conditions for emerging market and developing economies with balance sheet vulnerabilities."